Enjoy Museums, Art Galleries and Zoo in Ueno with More Exciting Deals! The UENO WELCOME PASSPORT is an All-in-One admission ticket that allows you to visit the following 10 exhibitions and galleries (one admission per place):Tokyo NationalMuseum, National Museum of Nature and Science, The National Muesum of Western Art, Ueno Zoo, Kyu-Iwasaki-tei Garden, Shitamachi Museum, Asakura Museum of Sculpture, Calligraphy Museum, as well as "Hiroshi Sugito" at Tokyo Metropolitan Art Museum and selected exhibitions from The Ueno Royal Museum. It also includes a map of Ueno so that visitors can explore the area while hopping around the museums. Do not miss out the stamp rally game where you get to win original goods such as clear files and others, by collecting seven stamps in each museum ! Apart from the ten abovementioned museums and galleries, the stamp rally game will take you to other exciting places such as the University Art Museum (Tokyo University of the Arts), Tokyo Bunka Kaikan (Cultural Center), International Library of Childrenʼs Literature, National Archives of Modern Architecture. Show your UENO WELCOME PASSPORT at these four places to receive free postcards! 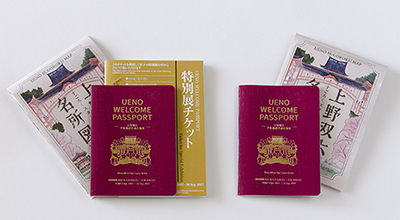 Savor a unique experience at Uenoʼs renowned art galleries and cultural museums with UENO WELCOME PASSPORT. Embark on this journey to rediscover the allures of Ueno full fo unforgettable memories. Choose between "Special Exhibition Ticket + Permanent Exhibition" and "Permanent Exhibition Only" ! Special Deals for Permanent Exhibitions! get a one-time admission to a designated special exhibition from the following. Collect stamps on the Ueno Sugoroku Map to win exciting prizes such as clear files! Have fun clearing the Sugoroku Map and exploring Ueno! Get a Free Post Card! 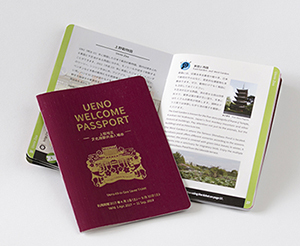 Display your Ueno Welcome Passport at each facility to receive an original postcard! Shops and ticket counters at the respective facilities listed on the Ueno Welcome Passport (Includes exceptions), Ueno Tourist Federation, Ecute Ueno, Asakusa Culture and Tourism Center, Matsuzakaya Department Store (Ueno), Ueno Marui, Keisei Information Center (Narita Airport), Tokyo Tourist Information Center (Tokyo Metropolitan Government Office) and others. * The places above are subject to changes. Pelase refer to http://ueno-bunka.jp for latest updates. Implementation Committee for New Concept " Ueno, a Global Capital of Culture"